Anyone have any good pics for Pikes, bills and other various hooks and such? ...and I'm still trying to find me one of those handle-hooks that Marlon Brando and all the other longshoremen wear around their necks in my all-time favorite movie "On the Waterfront". By which do you mean a longshoreman's cargo hook, such as this one? I am not sure, however, just how far back the longshoreman's hook goes. 1800s? Certainly. Earlier? I don't know. Anyone have the scoop on that? Anyone know any dated artifacts to push well past the 1850s? Yes, pretty much but the one shown in the picture has a small hook. But that still does not answer the question of dates and period. How far back do dockers'/stevedores'/lonshoremen's cargo hooks go? Anyone have an answer? Well, as mentioned, cargo hooks have been around since at least the mid-1800s; whilst they are symbolically the icon of longshoremen and dockers [even being the symbol for the 1930s longshoremen's union and strike in the 'States], they have likely been picked up as a useful tool by any occupation which deals with moving bales or bundles, whether a ship is involved or no. I've used one myself [! ], but alas, that only dates it back to this past decade or so [grins]. I can't seem to find reference to it any earlier than early 19th century, in Boarders Away, vol. 1. Does anyone have any idea of the earliest they were used? They look totally wicked. That would be perfect for demos and if made correctly??? For rough housing!! Mr. Bottles is already taking care of that very task Captain!!! I've into some problems with the boarding knife. 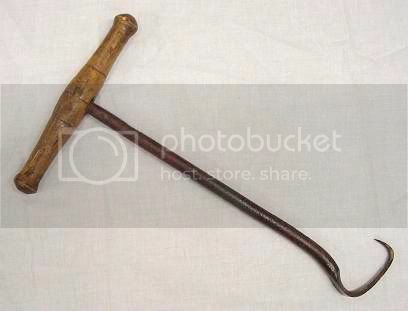 Keeping in mind that it was a specialized tool, and not a general purpose sailor's tool, I have come across a number of records that indicate that whaling was prevelant in the colonies during the GAoP, but I haven't been able to find any pictorial evidence. Can anyone point me toward some period images of whaling? And it need not be english colonial whaling. Acadian whaling images would be fine as well. Lo those many years ago I spoke with the curator of a new england whaling museum (I forgot who) and he suggested that they didn't predate on-board rendering plants, which places them smack dab in the 19th century. And that's why I never made one out a paul chen hanwei rapier blade and beat up Rats with it. I found this one from the 1640s. Some boathooks circa 17th/18th century. Ah, I meant the boarding knife.